Asphalt has been used on bridge decks for over 100 years with the intent of providing an effective road surface area for traffic and limited water-proofing properties. Historically, standard materials have functioned well without the need for modification but as traffic volumes and loads have increased, demand has necessitated a shift to high- performance surfacing materials. Thermoplastic polymeric additives are combined with standard hot mix asphalt or super pave mix designs to achieve enhanced performance characteristics in the finished asphalt mix. The polymer crosslinks within the asphalt as the mix is heated. The result after the compaction process is completed is an asphalt course with a minimum 96% of maximum density. 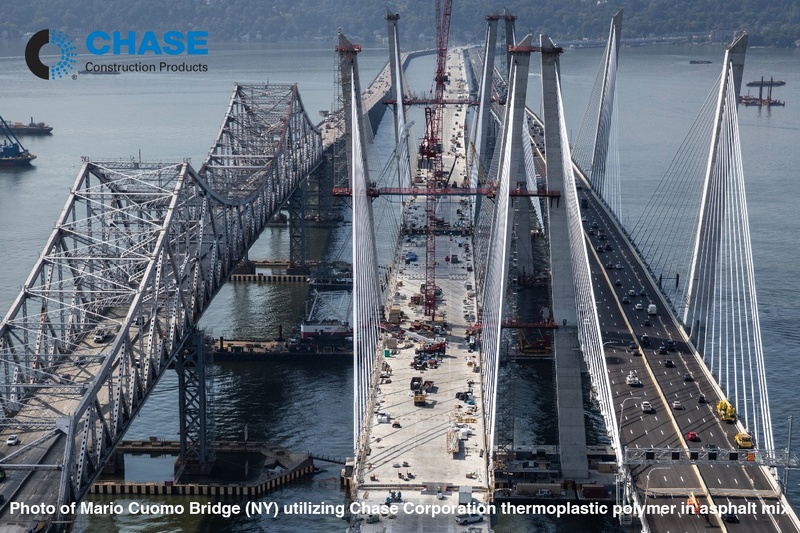 Thermoplastic polymer is engineered to retain its structure at lower bridge deck temperatures subjected to vehicle traffic with little deformation. The polymer additive is processed utilizing conventional hot mix asphalt plants, pavers, and associated equipment. The specific polymers provide a long fatigue life, low stiffness, and relatively flexible material. As a result, the modified asphalt surface layer is impermeable to water intrusion, preventing moisture damage and reducing of rutting and shoving. These thermoplastic polymer additives, combined with standard asphalt binder and aggregates, assist in reducing project costs, scheduling time and life cycle costs. By providing a one-step installation process that does not require special equipment, these highly modified asphalt mixtures allow for a rapid return to service – in as little as one hour. 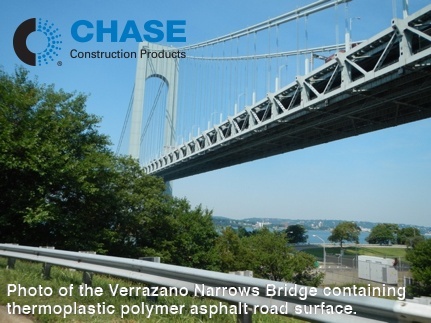 Chase Corporation’s Rosphalt R50 product is an innovative dry mix polymer additive which provides solutions for punishing conditions requiring superior performance capabilities on both newly constructed and existing bridge deck projects. Besides bridge decks, Rosphalt R50 can be used on approach ramps, highways, airport runways and taxiways, toll booth plazas, parking garages and high traffic intersections. Contact us if you want to learn more about Rosphalt products. You can also request a Free Sample to try the quality or our products.